Our Rich House Vanilla Estate Vanilla is a sophisticated vanilla carefully constructed to emphasize the hint of a woody, chocolatey, slightly earthy note you get when smelling a fresh vanilla bean pod, the tiny hint of boozy extract and a creamy note reminiscent of French vanilla. It contains our hand-tinctured organic vanilla beans and a variety of EOs and synthetics to create a rich, sweet, deep, creamy, ethereal vanilla. It is relatively linear and consistent smelling as it wears but not flat. The overall effect is a complex vanilla focused fragrance. It has a mix of sugar infused with vanilla, French vanilla, cream, raw vanilla pods, a *hint* of boozy vanilla extract and even a subtle marshmallow note. Estate Vanilla opens with the scent of deep fresh vanilla pods and then lightens into the rich French Vanilla, cream, sugar and vanilla extract profile for the rest of the wear time. This labor of love is our house vanilla fragrance for vanilla lovers. Spray generously and envelop yourself in a cloud of decadent vanilla. Estate Vanilla is exclusively available to the EDP format. Estate Vanilla gave me a surprise. Baking is my hobby, and I couldn't wait for EV to try because I love the scent of vanilla extract. I sprayed this on yesterday. EV smells boozy to me when it first goes on, which l love! After a few hours on, it settles into warm vanilla, still vanilla, but calmer. Then, later in the day, I was standing in the hot weather waiting to get into a NY Mets bball game..as my body was heating up, EV starts smelling incensy and woodsy. Really? Didn't expect that at all, loved it. By the time we were done watching the game at about 11 last night, EV had turned into some musky type scent on me(my absolute fav scent) with the vanilla still identifiable but so much warmer. I am sure people at the game thought I was a weirdo, because I was smelling my wrist all night. This vanilla is not like any vanilla I have ever worn. It has so many layers, and so much depth. I find it stays close to my skin, but moves around me when I move, if that makes sense. It reminds me of wearing a heavy sweater on a cool fall day, with all the layers of softness wrapping me up in warmth, and the hint of smoke in the air from woodstoves burning in someone's house. Just a wonderful down to earth scent. Estate Vanilla wet is a lovely boozy vanilla. As it starts to dry down, the complexity of the scent appears. The vanilla is warm and earthy on my skin. As I inhale, the earthiness is that of a dense dark vanilla bean. However, the perfume isn’t too heavy. There is a light creaminess to it as well. It reminds me of when I make a Crème Anglaise. It is silky, rich, and comforting. Personally, I see myself wearing Estate Vanilla more in the fall and winter. I’d love to spray it on one of my favorite cozy sweaters and relax. This is my new favorite scent to wear to work. I think it’s definitely work-friendly and I get many compliments from coworkers. One coworker stopped by my desk and inquired who the perfumer was. If you are a vanilla fan, this one is a must have. I'm a huge fan of vanilla (I think that all of my favorite fragrances have a noticeable vanilla note in them), but I only wear Indult's Tihota and Maria Candida Gentile's Noir Tropical when I'm craving a pure vanilla. I measure all other vanilla fragrances against those two, and I didn't think that Estate Vanilla would wow me as much as it does. Estate Vanilla is now in my top 3 of favorite vanilla scents, though. Estate Vanilla reminds me of white chocolate. Really good white chocolate. It's sweet, creamy, and rich. There's a warm, caramelized, dark booziness to the scent as well, like a really good vanilla liqueur. There's also a little bit of powderiness here, and a touch of smokiness, but it doesn't go to baby powder and sort of just grounds the sweetness and makes it more wearable. I've tried *so many* vanilla fragrances over the years, and I can almost always say that one reminds me of another, but I can't think of another fragrance that smells like Estate Vanilla. It's unique and beautiful and makes me feel less jaded, lol. I'm so glad that I took a chance on a sample and that I was able to purchase a big bottle in the latest restock. Estate Vanilla is going to be my go-to vanilla for this fall and winter <3. I was very excited about this one as I am a huge vanilla fan but was heartbroken when Cenobite just didn't work for me. Tried this as soon as my package arrived and was a little disappointed as the first notes that hit me were boozy and a little like Cenobites sillage. It was still a very pretty vanilla but the top note was a little too jarring for me. As soon as it settled on my skin though the exciting Estate Vanilla journey began. Angela is a wonder. It warms up and the boozy note burns off very quickly on my skin leaving a warm, rounded, deep vanilla extract scent. The sillage is all bakery warmth on my and I get compliments everywhere. It lasts all day on my skin and it's even better on anything I've worn that day. I love finding a scarf I've had on because it holds all my favorite aspects of Estate Vanilla. It's perfection. Confession Time..I was skeptical that I would ever feel the need to purchase a perfume that costs more than 50.00. Call me cheap, but I figured I could always find something similar for less. I purchased a sample of Estate Vanilla and EVERYTHING changed. It smells so good. On me it smells good from the first spray, to the final dry down and lasts incredibly long. I must save my pennies for a full bottle, so keep your fingers crossed for me that I get the job offer I've been hoping for. 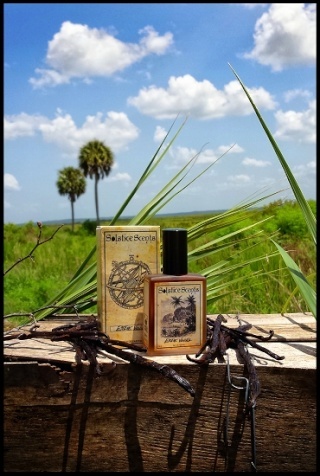 I want every piece of clothing I own to smell like freshly scraped vanilla beans. I have since ordered and received this beautiful bottle of perfume. I have wore it everyday since receiving and every single day someone comments about how good I smell. This perfume will be a long timeless favorite for the rest of my life! 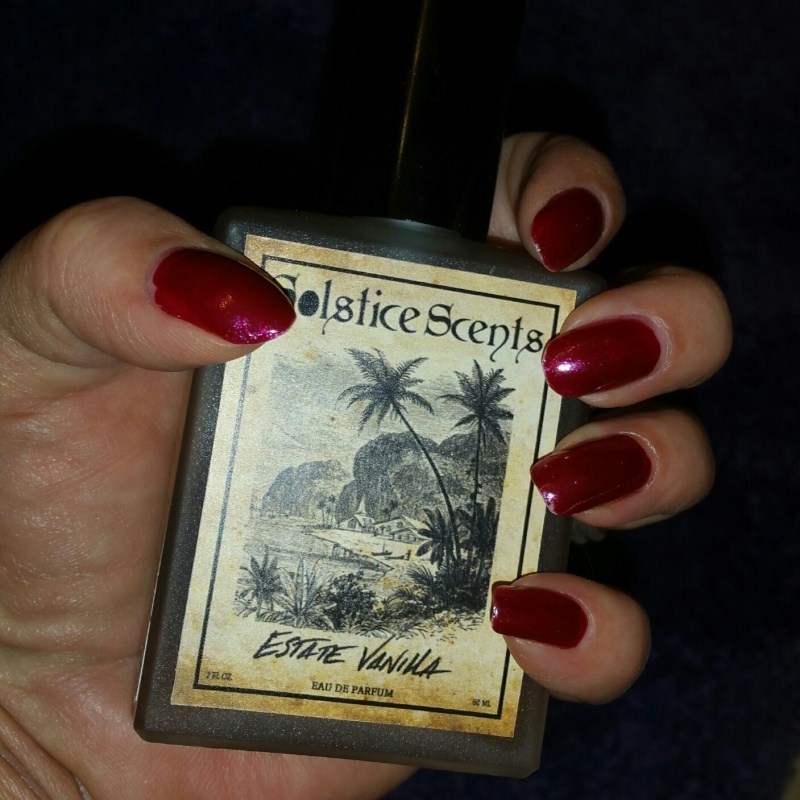 Solstice Scents has been a go-to fragrance company for me for quite a few years now. As these new EDPs were being developed, I was thrilled to hear that a vanilla perfume would be in the line up. I figured, I would first only try a sample. As the release date arrived, I found myself getting super excited, and also trusting Angela and going for the full size bottle on Estate Vanilla! The vanilla is such a elegant beauty; so yummy, delicious, flirty and just amazingly blended! I am so pleased with the perfume, finding that I wear it quite often: to work, on weekends - day or night, really anytime I want a lovely vanilla scent to cozy up next to me, and smell just absolutely gorgeous! Estate Vanilla works well as a stand alone scent but can also do well as your base, and then maybe choosing to add other scents as the day goes on, with the vanilla still being at the heart of your fragrance! It's easy for me to say that I will probably always have a bottle of this on hand. Estate Vanilla by Solstice Scents. The notes are listed as; raw vanilla pods, vanilla infused sugar, cream & vanilla extract. It is so much more than just those notes, though! It opens exactly how vanilla extract smells. It takes you back to learning how to bake, and smelling all the ingredients. I wasn't sure I wanted to smell like that though. Luckily, it morphs. The sweet notes seem to appear. The slightest touch of a burnt sugar, mixed with various vanillas. Maybe the burnt smelling I am picking up on is a bourbon vanilla? Finally, it settles into something I can barely describe. There's a myriad of vanillas. Some wild, some cuddly, some like pipe tobacco. Although, I am told there is absolutely no tobacco. It's an ever shifting vanilla. This keeps it so refreshing, and you notice different layers throughout the day. You can smell it on you all day long. I never really thought of myself as a vanilla gal, now I do. The strength is equal to a Serge Lutens. Yes, equal. This is a delicious, high quality-crafted scent. This reminds me of gourmet marshmallows. The trouble with many rich vanilla scents is that there is a buttery note that cheapens the overall wear or makes scents cloying. This perfume doesn't have it, so the sillage is comfortable. I agree with Kelly; the various vanillas shift throughout a wearing, so I do not grow bored or anosmic to this fragrant delight. Estate Vanilla is lovely right out of the bottle. I immediately smell sweet vanilla extract, but better and so much more. It has more depth than any vanilla extract I have sniffed (I am not a cooking person). This is what I imagine a "real" fresh vanilla extract would smell like. It is boozy vanilla liqueur, fresh vanilla pods and sweet, white chocolate truffles. It is all there, vanilla in its many facets. On the dry down, a pastry like sweetness emerges. It reminds me of cookies sprinkled with powdered sugar. On clothing the powdered sugar cookie quality is lost, and only that sweet vanilla base is left with just a hint of the more complex opening. At this point I am longing for the boozy, complex and exciting opening, but I am comforted by the sweet fluffiness that remains. The warm vanilla base remains for hours, mostly unchanging, but occasionally I did get strong impressions of that Solstice Scents trademark "mallow" scents. Estate Vanilla has a very delicious opening but dries down to a comforting, smooth vanilla sweetness. It lasts, but is not overwhelming in sillage. The sweetness is not overpowering like some sticky gourmands can be. This would be a great workplace scent alone, and I suspect it would layer well with fruity or floral scents as well as more heavy woody or incense blends. I'm a vanilla lover, and for me, this is one of the best vanillas out there. It's nothing like Cenobite, though it does have a bit of a boozy opening. The best comparison is to a pure vanilla extract, but it's less boozy and more comforting than that, and it dries down to a sweet-but-not-cloying vanilla that has a hint of baked goods. Gorgeous, sophisticated, this is vanilla at it's finest and truest. This vanilla is very lovely. Not your "kid" type vanilla but a wonderful adult perfume smelling of comfort and smoothness. It's sweet yet not sickly. Just perfection. My favorite vanilla scent to date. I think I need to spray more 'generously!' I haven't worn an edp in quite some time- I stick rather heavily with oils...but I am not biased! This perfume on first application tended to be a little to light for my taste. However, as for scent...at first I wasn't sure if I liked it. It goes from strong vanilla liqueur, which is rich and lovely. It quickly loses the booze and turns into a rather normal vanilla with a sourish note. Sometimes I equate this kind of vanilla with the Madagascan variety (even if that is my favorite variety) in certain perfumes. This certainly is a morpher though...because about twenty minutes in it changes into a warm average vanilla aura with good throw. It lasts all day on me, in its many phases. I will have to try it a few more times to see if I find it an exciting enough vanilla for me! This is a gorgeous, luxurious, intoxicating, and addictive vanilla scent. It's gourmand and sweet, but not sickly sweet like so many other vanillas, and also not spicy. It is a true vanilla. The best I have ever smelled, and I'm a vanilla girl. I truly believe Angela is a vanilla genius! The initial notes are stronger, like extract, but the dry down is fluffy and soft. The only downside to this, like many vanillas, is it stays close to my skin and doesn't last all day. Excellent alone, or as a layering scent with just about anything. I wish this was offered in a rollerball for mid-day touch ups.